You have selected your patio dining set, citronella candles, and Tiki Torches for your next big summer bash at home. But do you know what the temperature is going to be the night of the party? Or maybe you are planning a trip to the beach. You can now find out what the temperature is inside and outside your home without stepping outdoors. Pick one of the top 10 best indoor and outdoor thermometers and stay updated with the weather. Each of these temperature-sensing devices you can install in your home. You can even find one to place outdoors as well. 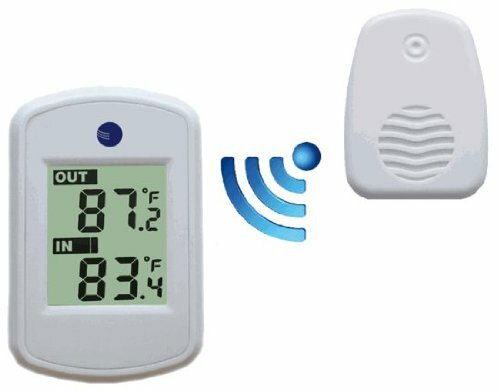 The white WS-04 thermometer from Ambient Weather is compact and wireless. The sensor you can install outside or anywhere in the home. Now you can sit back and watch the temperature reflected on the console. You receive accurate data and the display is easy-to-read. You can carry the display with you and has a range of 120-feet. Here we have another indoor-outdoor AcuRite thermometer. You can easily plan your day with this device. With the accurate data, you can plan your day at the beach or even that fiesta in the back yard. The fantastic thing is the thermostat displays the temperature and humidity. You place the outdoor sensor to receive wireless data and have a weatherproof construction. 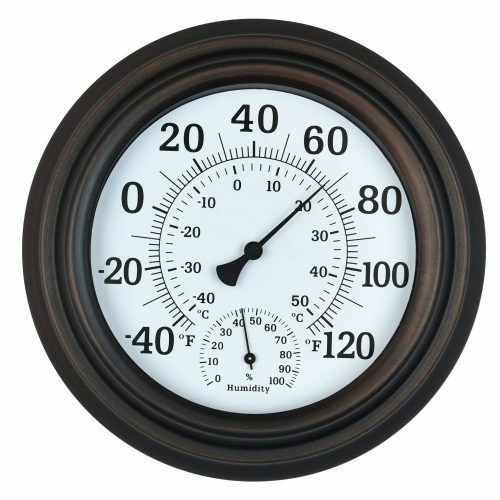 For a classic styled outdoor thermometer with a metal analog display, the WiHoo is perfect. You can place it on the patio to receive temperature readings. The metal structure has a glass lens with a satin nickel finish and is shatter and weather-resistant. The thermostat coil presents you with accurate readings displayed on a bright background. Furthermore, you do not need to calibrate it and just place it in the fixed location. 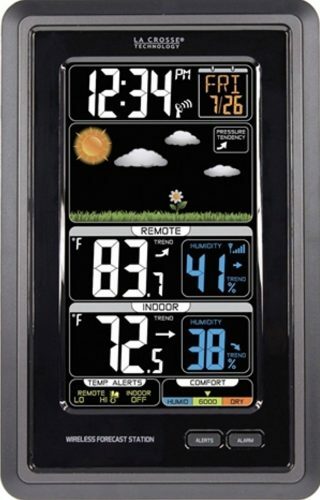 The next Ambient Thermometer offers you three different indoor displays you can connect to one outdoor remote sensor. The indoor-outdoor thermostat is compact and simple to use. The fantastic thing is you can share it with your neighbor in a radius of 120-feet. In a cost-effective way, make sure to look at this model here. 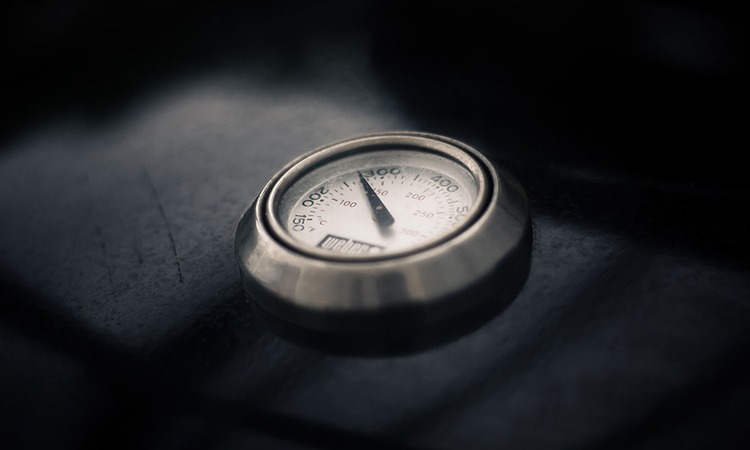 With the indoor-outdoor thermometer, you can view your backyards temperature from inside your home. The digital weather device works with a wireless sensor and displays the temperature in color. Furthermore, it does not only measure the temperature, but provides you with a dew point, heat index, humidity, and more. For a reliable thermostat, you will not be disappointed with this device. 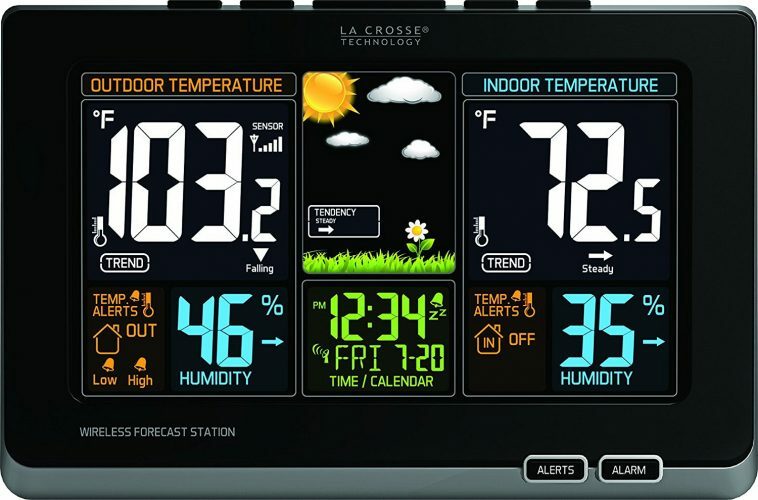 Here we have one of La Crosse Technology outdoor thermometer that has the precision color display. You can plan your day with the indoor and outdoor temperature readings displayed and are easy to read. The brightness level of the colors, adjustable and automatically transmits from the data to the display. 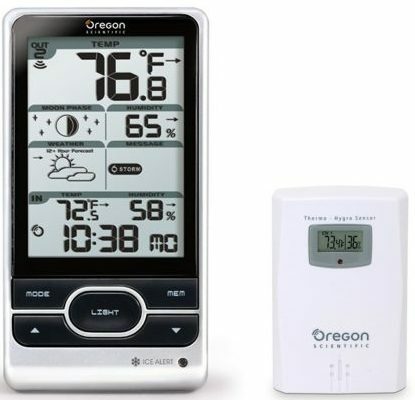 For a stylish and reliable outdoor thermometer, you can look at the Oregon Scientific model. The weathers displayed in graphical icons. You can see the heat, wind, storm, fog, frost, and more that are available on the display. 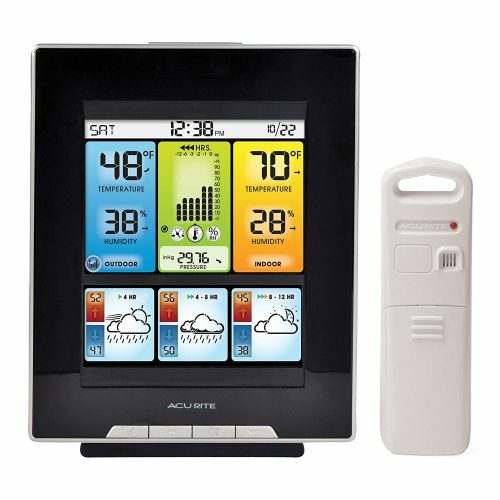 Plus, the device alerts you with different weather forecasts and the LCD display is easy to read. On the console, you can find the time and date that update automatically. Also, the outdoor sensor works well with wireless technology and can be mounted easily. 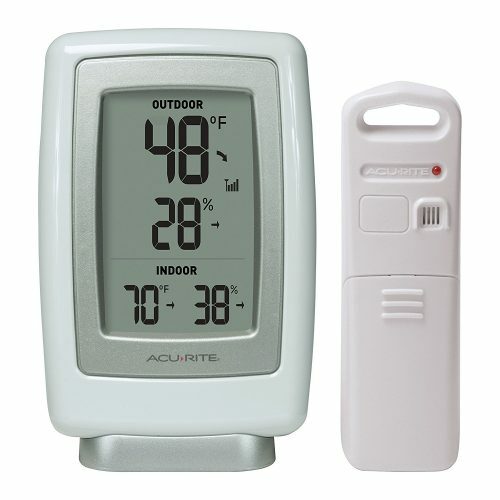 To achieve the best weather data you need the next AcuRite thermometer to read the indoor and outdoor temperature. Plus, the device uses precision forecasting technology and combines weather patterns of North America with the measured data that supplied by the sensors. In addition, the color LCD display has built-in sensors to read inside humidity and temperatures. Not to mention, the outdoor sensors work with wireless technology which resists the effects of severe weather, built with a hanger to mount. Now you can plan your day by checking it out here. For an easy-to-use weather forecast thermometer, you need the Ambient Weather. Included you receive the WS-10 console with an indoor thermo-hygrometer sensor and three remote sensors for outdoor placement. 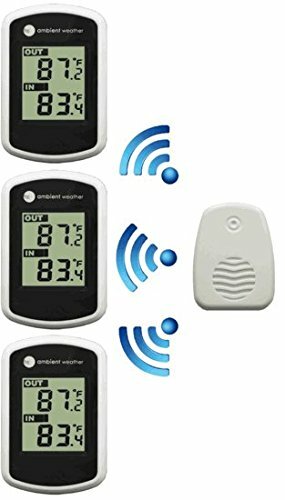 You can connect it up with eight remote sensors and view the readings of all of them at the same time. Instead of using your smartphone to read the temperature inside and outside, use one of the top 10 best indoor-outdoor thermometers reviewed by us. They are easy to mount and offer you different weather forecasts to see the temperature. You can even find one that offers you humidity data and precision forecasting. Plan your day at the beach with one of these devices today.